Interest in computer science education is booming across Europe, as it is being increasingly recognized as a critical part of a student’s academic preparation for the new global economy. Yet not enough students are being given the opportunity to develop the technical skills necessary to allow them to be creators of future technological innovations. We want to do something about that. As part of our efforts to be a catalyst for developing the computer science education landscape, to encourage more school students to learn about computing, and to ensure that all of them have an opportunity to get the right skills, we participated in the European Commission’s, Europe Code Week 2016, initiative, which took place Oct 15-23. To inspire students about future careers, we connected Googlers in our Zurich, Dublin and London offices virtually to students in classrooms from Ireland to Italy via Hangouts. 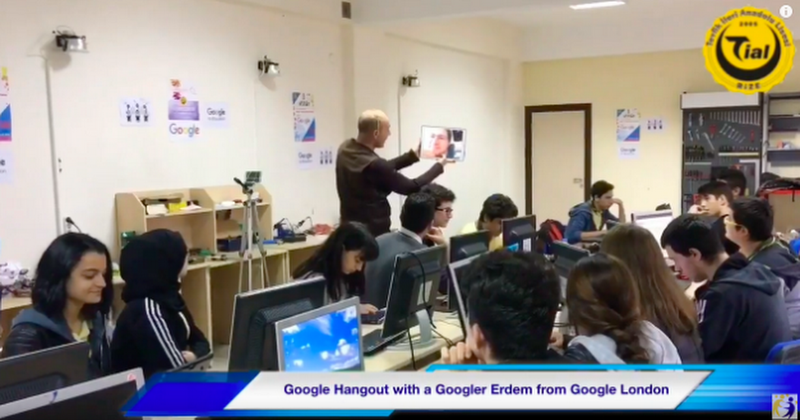 This gave students an opportunity to interact with a Googler from their country despite the distance, to hear from a professional in the tech field and ask lots of questions about how they got there. Furthermore, we provided sponsorships to organizations who ran computer science outreach events: from Albania to Austria, Greece to Germany, and Spain to Serbia and in between, we were able to support 46 organizations in 29 countries who were doing innovative, inspiring and interactive things to get students excited about computer science. In Ireland our awardees included Crana College, who ran their “Exploring Coding” event where students participated in a week of coding and programming related workshops, with plugged and unplugged activities. In Italy, Fondazione Mondo Digitale ran “Simple Future” a training program based on coding aimed at students aged 6-18 from schools around Rome. In Slovenia, Šolski center Nova Gorica ran an App Development with Android; In Turkey, Robincode ran “Code Your Dreams” with multiple sessions for four days to raise awareness of programming, coding and algorithmic thinking. Other cool initiatives included Associació Eduin in Spain’s “Coding and robotics linking generations’ initiative to bring students and parents together to learn basic programming; Foundation Simplon’s Simplon.Kids in France and Asociatia ADFABER’s Codeweek 4 girls event in Romania. You can read more about the sponsorship recipients here. In total, Google supported 25,000 students to take part in coding experiences in just one week. Overall, during Europe Code Week 2016 an incredible 20,000 events took place inspiring hundreds of thousands of students - an absolutely incredible effort! We hope to see the enthusiasm continue. See Code Week’s events page to see all the different activities still happening, and learn more about Google’s effort in computer science education at g.co/csedu.